Trick or Treat! The Dungeon Lord is in a mischievously macabre mood, and no one is safe! In ‘A Clash of Pumpkins’ , the new Halloween-inspired DLC for Dungeons 2, the armies of evil will face new horrors including trigger-happy pumpkins, haunted forests and murderous penguins across 3 all-new, eerily beautiful skirmish maps. 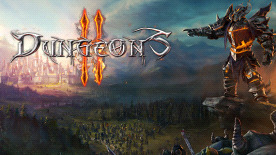 The extensive campaign story mode is packed with even more of the dark humour which made the original Dungeons a hit and is peppered with numerous references to various fantasy books, movies and TV shows. Additionally, you can test your strength in four different game modes in multiplayer for up to four players with other Dungeon Lords overLAN or online.